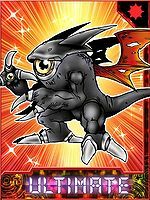 Like Demon it was originally a high-ranking Angel Digimon, but it fell to the Dark Area and is now one of the Demon Lord Digimon. 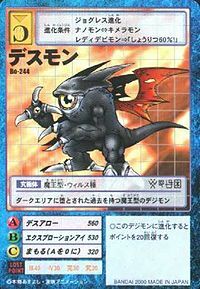 Even though it is a Demon Lord Digimon, it is different from other Fallen Angel and Devil Digimon in that it does not run the whole gamut of wickedness, but instead does its utmost to carefully maintain a position of neutrality. 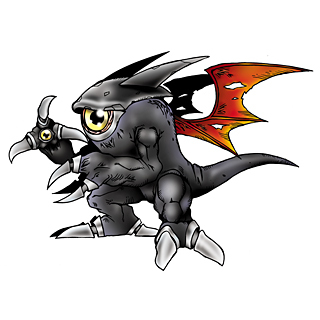 However, it is a terrifying Digimon, and it is told that at the time of the approaching final battle, that whitened appearance will change to jet-black darkness, and it will transform into a god of destruction. Its Special Moves are an arrow of death fired from the evil eyes on its hands (Death Arrow), and a laser beam fired when the eye in its head shines deep crimson (Explosion Eye). 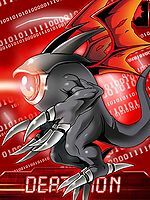 Deathmon was adopted from a winning Digimon entry in the "Digimon Web Dot-art Contest" which belonged to Mr. Takahiro Ino from Yamagata prefecture. From Samael, known as the Angel of Death, an important archangel in Talmudic lore, a figure who is accuser, seducer and destroyer, and has been regarded as both good and evil. An evil spirit or demon in Muslim folklore believed to plunder graves and feed on corpses. Death Arrow  デスアロー Desu Arō Death Arrow/Eye Blow Fires energy arrows from the eyes on its hands. Fires a destructive beam from the eye on its head. Confuses the enemy with a strange radio wave. 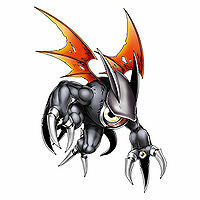 Deathmon is an enemy digimon. 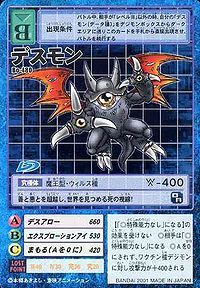 Can be evolved from Cyberdramon if above level 53 and Darkness EXP above 800. Can be evolved from Phantomon if above level 49, attack 230, and Dark EXP 10500, or can be found at Chaos Brain. In the past, this Demon Lord Digimon was relegated to the Dark Area. Having surpassed both good and evil, it watches the world with its gaze of death! This page was last modified on 15 April 2019, at 23:17.